January 4 is Colonial Repression Martyrs' Day in Angola, a very important holiday in the history of national liberation struggle against the Portuguese colonial occupation. 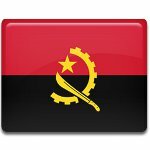 Portuguese occupied Angola in 1482 and administered it as its colony for about 500 years. The struggle against colonization began with the uprising of the peasants who worked for the cotton company. They demanded better living standards and working conditions, exemption of the tax and the end of enforced labor. Portuguese decided to repress the demonstrates and killed over 10,000 peasants on January 4, 1961. This event caused a multi-faction struggle that spread all over the country and took the form of three national movements and a separatist movement. These movements were stopped in 1974 when Portuguese regime Estado Novo was overthrown. A new regime immediately stopped all military actions and declared independence from Portugal. The demanding action that began a 15-year war is considered as one of the milestones in national liberation struggles. This uprising awoke the conscience of freedom and emancipation of Angolan people.